At University I was introduced to two opposing geologic paradigms. These were presented to me as a dichotomy, you were either on one side of the fence or the other. A notion which seemed absurd to me – why couldn’t you have gradual change punctuated by more rapid events? And this is something which I think transcends the world of geology, with parallels in our own societies. Each of us go about our daily business, we get up, go to work, pay taxes and go home. There’s a slight change every day which gradually changes the world around us, we recognise this as development or progress (or indeed decline). In addition to that, we occasionally experience more catastrophic events in the form of disasters, which exert massive change over comparatively short time-scales. Change results from both of these, there isn’t one dominant paradigm, but a combination of factors which shape both our world and our lives. The signs of past disasters are all around us. Especially if you live in or visit London. 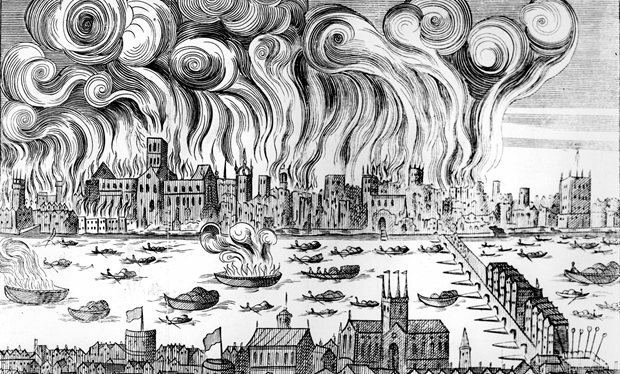 Today marks the anniversary of the ignition of the Great Fire of London in 1666 (play the game here!). This fire razed 80% of the walled city to the ground (however, it’s worth acknowledging that by this time, London’s conurbation had grown extensively and in total only around 25% of ‘London’ was affected). Over 13,200 buildings were destroyed, over 100,000 people made homeless. This was 347 years ago, and there have been many period of rebuilding, subsequent incidents and further rebuilding since then. Yet the scars of the Great Fire, which is commemorated by The Monument (you can climb the spiral stars to the top – I’d recommend it!) can still be seen in a few locations, if you know what to look for. With a 2000 year history, London bears the scars of a variety of incidents which have befallen her. Some tangible, some less so, but there’s no shortage of reminders around you in London that as much as things might evolve day to day, there’s nothing like a catastrophe to bring about change. DisasterTours can point out some of those scars, and give you some tips of preparing for London’s next emergency. Join us on our first tour on 19 October to uncover London’s disaster past.